The Launch Box extends the capabilities of the Street & Strip Box to the next level. 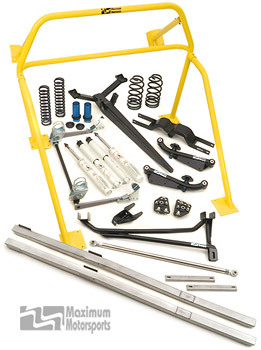 A Front Coil-Over Conversion Kit adds adjustability and saves weight. The Panhard Bar and Torque-arm's long lever arms really improve rear tire bite while eliminating the upper control arms and the need for upper torque box reinforcement. Our stiff, Adjustable Rear Sway Bar reduces body roll during launch. Top it off with the safety of our NHRA legal roll bar, and you will have a package capable of consistent 1.56 60-foot times without unduly compromising street manners. Items different from the Street & Strip Box are italicized. MM Adjustable Rear Swaybar, 7/8" x .188"
The Maximum Motorsports Launch Box will lower the elapsed times (ETs) of your street & strip 1987-1989 Mustang by improving traction. The Maximum Motorsports Launch Box will lower the elapsed times (ETs) of your street & strip 1987-1989 Convertible Mustang by improving traction.